Principal development of v5 has begun! Follow along on the canary branch and check out the current list of roadmap items. We will be publishing alpha versions to styled-components@canary on NPM as we get closer to a beta release. Please keep in mind that all development of styled-components is driven by volunteer effort, so things will take as long as they take. We appreciate your enthusiasm and interest as new technologies and patterns emerge. See the documentation at styled-components.com/docs for more information about using styled-components! If you're using tooling that has babel-plugin-macros set up, you can switch to the styled-components/macro import path instead to gain the effects of the babel plugin without further setup. If you wish to provide configuration options to the babel plugin similar to how you would in a .babelrc, see this guide. The config name is "styledComponents". 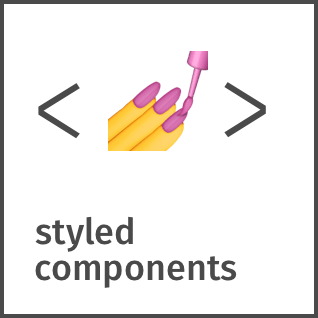 If you want to contribute to styled-components please see our contributing and community guidelines, they'll help you get set up locally and explain the whole process. Please also note that all repositories under the styled-components organization follow our Code of Conduct, make sure to review and follow it. Licensed under the MIT License, Copyright © 2016-present Glen Maddern and Maximilian Stoiber. This project builds on a long line of earlier work by clever folks all around the world. We'd like to thank Charlie Somerville, Nik Graf, Sunil Pai, Michael Chan, Andrey Popp, Jed Watson & Andrey Sitnik who contributed ideas, code or inspiration. Special thanks to @okonet for the fantastic logo.